Mark Driscoll’s recent troubles have been well-documented. It seems that he is facing the consequences of his behavior and mode of discourse over the last decade or so. 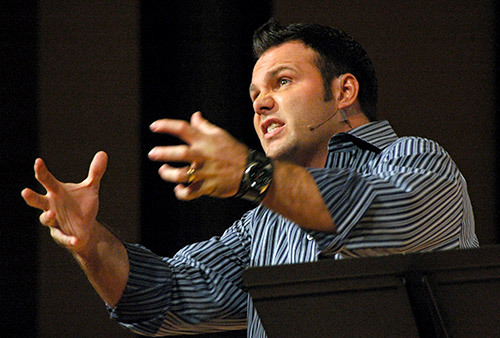 A few weeks ago, Jonathan Merritt wrote about forgiving Mark Driscoll and then several days ago about not celebrating his downfall. I think that Merritt’s impulses are good ones. There’s nothing good about delighting in someone else’s suffering, even if self-inflicted. And it’s destructive to hold on to bitterness and to refuse to forgive. Yet I don’t think that the responses Merritt suggests are appropriate. Forgiveness is something that must take place between parties that have a relationship or some kind or share a covenant bond. It is up to Mars Hill Church members and staff to decide whether or not to forgive Driscoll. It isn’t up to me or Jonathan Merritt or anyone else who isn’t part of that church. Further, the alternatives of whether or not to delight in my enemies’ calamity likewise confuse the situation. Mark Driscoll isn’t my enemy. He isn’t anything to me other than a well-known media figure in Seattle. The father in Proverbs exhorts his son to develop wisdom by clear-eyed observation of life. He teaches him to sharpen his skills in critical analysis, taking note of what happens to people who act honorably and dishonorably, people who are generous and those who are stingy. How do things go for them? How might it have been otherwise? Without having destructively critical spirits, we can critically examine the dynamics of the situation and learn from what we see. We can quietly but closely observe how Mark Driscoll’s behavior and speech has affected others and learn from the consequences. What happens over the short term and long term to people (ministry leaders and pastors) who act like Mark Driscoll did? What are the dynamics of the celebrity pastor and the high profile ministry? Is it inevitable that they are internally destructive while outwardly impressive? I think Merritt’s motives are right for commending forgiveness and rebuking a self-assured and smugly celebratory spirit. But the postures that Merritt suggests are misguided. To follow them would be to miss a good opportunity to learn. I won’t be exulting in Mark Driscoll’s trouble nor do I need to forgive him. But I’ll quietly watch and store away some lessons from what I see. You are spot on, Herr Professor. Well said and well thought through from a Scripture basis. Keep up the good observation. Indeed there is much to ponder about the dynamics of celebrity pastors and high profile ministries. I have seen these dynamics in all sorts of contexts. I think we need to re-consider Paul’s model of boasting in one’s weakness. Exactly, S. I cut some comments out of my post, but I was going to remark about Driscoll that I haven’t paid much attention to him other than to marvel that in one of my classes on Paul, a few students seemed to grasp the dynamics of weakness but also thought very highly of Driscoll . I completely failed to get my head around that!! Thanks for this, Dr. Gombis! As I skimmed through the recently uncovered online rants, it struck me that the problem is deeper than just Driscoll’s profanity and his combative attitude. As we observe and learn from this situation, I hope evangelicals will think long and hard about the view of women which Driscoll holds. Good word, Tim. I agree wholeheartedly with your sentiments here. Celebrity preachers. You can have them. The focus tends to be on them…instead of where it belongs. He is a legalist/schizophrenic type preacher, anyway. Gives the gospel…then rips it away again in the next sentence. I appreciate your words! But with one caveat. Surely he is more to you than merely “a well-known media figure in Seattle.” He is a brother, no? Still, your remarks seem on point, but this caught me off guard a bit. Hey Michael, Someone asked me about that on Facebook, and it’s a good question. But it seems that there are a number of factors that indicate to me that there is no covenantal bond of Christian communion, the free church tradition and the flaccidity of contemporary American evangelical Christian ecclesiology, notwithstanding. It seems to me that with reference to me (and other non-Mars Hill Church folks), on one hand he is a human and I wish him well and hope for resolution in the conflicts in which he is involved. On the other hand, with reference to me, he is little more than a media creation within the market niche of American evangelicalism. Being a superstar within that orbit of conferences, conventions, bookstores, etc. doesn’t make a person a Christian. And it seems from the chaos and confusion surrounding him and the institution he’s part of, I honestly just don’t know. I mean that literally. You know how the early church required papers and commendations from churches when a person claiming to be Christian came to town and was looking for fellowship. It seems to me that we would do well to be just as skeptical when a person’s public behavior indicates anything but Christian discipleship. Now, just to be clear, I’m not judging him as an unbeliever. I simply don’t know the guy. I’m only saying that I don’t assume that we share a covenantal bond of Christian fellowship and thus I don’t assume that I need to forgive him (or that I’d have that right or responsibility). He hasn’t wronged me. He’s been little more than the topic of FB and blog critiques that I’ve sort of been aware of for the last few years and that I’ve frankly found intensely uninteresting. I think there is something missing in this article. I believe we also should actively seek justice for those that have been abused and marginalized. We should love mercy even when God extends it to people we feel deserve to suffer for their actions. Finally, maybe we could also maintain an attitude of humility before God as well.